1) What is Test Planning? 2) What is Test Plan? A document describing the scope, approach, resources and schedule of intended test activities. It identifies amongst others test items, the features to be tested, the testing tasks, who will do each task, degree of tester independence, the test environment, the test design techniques and entry and exit criteria to be used, and the rationale for their choice, and any risks requiring contingency planning. It is a record of the test planning process. 3) What is IEEE Test Plan Template? 4) What are the important tasks in Test Planning stage? 5) What are the reference documents for Test Planning? 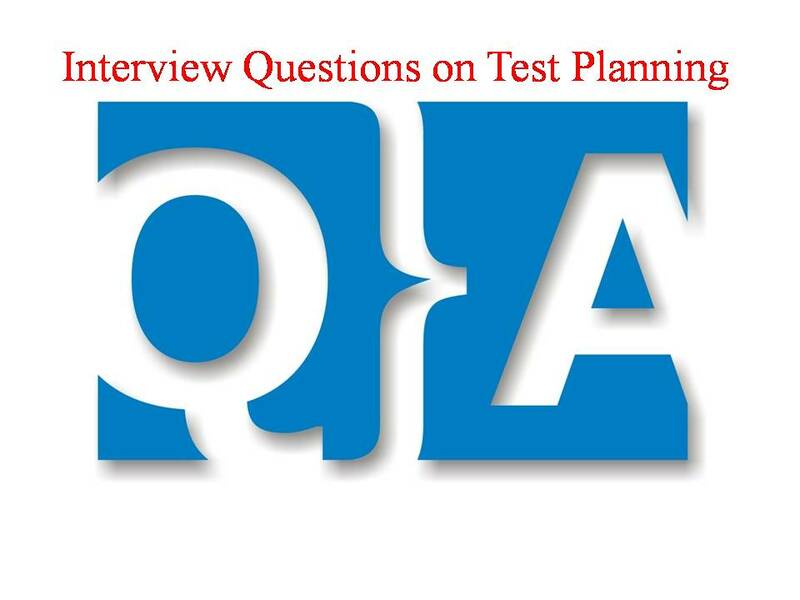 6) What is the Output of Test Planning phase? 7) How Test Lead defines Test Lab Setup? Test Lead defines Test Environment set-up based on System Requirements specification document. 8) What are the considerable factors for Test Estimations? 9) Who is the Author of Test Plan Document? 10) Who approves Test Plan document? Generally Project Manager approves the Test Plan Document after the review process. 11) What is Test Point Analysis? A formula based test estimation method based on function point analysis. 12) What is Software Test Process? The fundamental test process comprises test planning and control, test analysis and design, test implementation and execution, evaluating exit criteria and reporting, and test closure activities. 13) What is Function Point Analysis? A Method aiming to measure the size of the functionality of an information system. The measurement is independent of the technology. This measurement may be used as a basis for the measurement of productivity, the estimation of the needed resources, and project control. 14) What is Entry criteria in Test Plan? The set of generic and specific conditions for permitting a process to go forward with a defined task, e.g. test phase. The purpose of entry criteria is to prevent a task from starting which would entail more (wasted) effort compared to the effort needed to remove the failed entry criteria. 15) What is Exit criteria in Test Plan? The set of generic and specific conditions, agreed upon with the stakeholders, for permitting a process to be officially completed. The purpose of exit criteria is to prevent a task from being considered completed when there are still outstanding parts of the task which have not been finished. Exit criteria are used to report against and to plan when to stop testing. 16) What is Test deliverable? Any test (work) product that must be delivered to someone other than the test (work) product’s author. 17) What are the Test deliverables in Software Test Process? Problem reports and corrective actions. 18) What is Master Test Plan? A test plan that typically addresses multiple test levels. 19) What is Wide Band Delphi? An expert based test estimation technique that aims at making an accurate estimation using the collective wisdom of the team members. 1) How to select appropriate add ins for our AUT (Application Under Test)?